The ProportionFit Diet was created by Dr. Nick Meyer, an orthopedic surgeon and former athlete. Research and personal observation led him to discover a simple secret for effective weight loss. A new way of thinking about food and calories. Practical techniques for easy portion control. ProportionFit explains that successful weight loss requires a combination of an appropriate calorie intake with physical exercise. Portion control is one method that can help you consume the correct amount of calories. On this program a portion is a cup of food. The number of cups you require each day is determined by your body weight. For example someone weighing 150 pounds needs 7.8 cups of food each day to maintain their weight. A person who weighs 300 pounds needs 15.6 cups. In order to lose weight you will consume a fixed number of cups less than your daily requirement. Each daily cup deficit will lead to approximately half a pound of weight loss per week. Never consume fewer than 4 cups per day (approximately 1000 calories). The ProportionFit Diet system can be applied to your current diet and doesn’t ask you to change what you eat. Just make or buy whatever you would normally eat (within reason) and keep track of your cups (portions). 1/3 Carbohydrates – mainly fruits, vegetables, pasta, bread etc. 1/3 Protein – meat, fish, seafood, dairy. 1/3 Fat – cheese, butter, nuts etc. It is not critical to keep this ratio exact or constant. Think of it as a general guide and try to maintain these intakes on average. Try not to drink more than 200 calories daily. The author suggests sticking with water, diet beverages, coffee, skim milk and tea. Ideally alcohol should be avoided. If you don’t want to give it up you can drink one or two alcoholic beverages a day. However these must be counted in your daily allowance on a cup-for-cup basis. Vigorous exercise should be performed for at least one hour, three times a week. If you do more exercise you will burn more calories. Walking, jogging, aerobics, swimming, yoga, tennis, skipping and spinning classes are recommended. However, the key is simply to move your body, sweat and burn calories every chance you get. 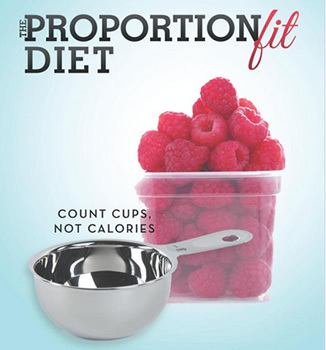 The ProportionFit Diet: Count Cups, Not Calories retails at $14.99. Offers a simpler and more practical alternative to calorie counting. Can be used with any diet of your preference. Dieters can continue to enjoy their favorite foods. Calorie intake is adapted to suit the needs of the individual. Can be adapted to achieve rapid or more gradual weight loss. Requires measuring and recording everything you consume. Does not contain a meal plan or suggestions on what to eat. Encourages consumption of diet soda, which research suggests has negative effects on health and weight management. Dieters who favor high-fat foods could consume more calories than expected. The ProportionFit Diet offers a simple way to measure portions and control calorie intake. Most people will find this to be an effective method for reducing calories and losing weight. However, for best results dieters should choose a balanced variety of nutritious foods in the daily diet.